After losing much of its oil and gas revenue to Islamic State, Syria has been looking at every opportunity to fill its coffers. The government has now introduced a tax on shawarma – traditional Arab dish of grilled spiced meat cut into slices. “Last week I had to pay 220 Syrian pounds (US$1) for my shawarma sandwich instead of 200 and the restaurant owner told me it was because there’s a new 10 percent ‘reconstruction tax’ that’s being imposed on each sandwich,” a Damascus resident told AFP. Syria’s government has also cut subsidies for bread and brought in higher prices for water and electricity. The State-owned TV network has doubled the monthly fees for its 4.5 million subscribers. The move is intended to add $308 million to the budget. However, the opposition journal Syria Report says about 40 percent of the network has been damaged. The government has also ordered a cut in energy consumption in state organizations and the ending of thousands of temporary contracts. 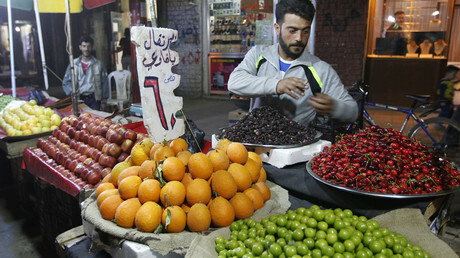 Damascus has increased exports of citrus fruit to Russia after Moscow banned food imports from Turkey. Syria has been damaged by the civil war that began in March 2011 in the aftermath of the so-called Arab Spring. It has been reported the conflict has killed 250,000 people and created over four million refugees.